The final minutes of Rockets-Thunder on Tuesday night were a dense flurry of batshit. They featured Russell Westbrook swooshing a runner from 27 feet, Paul George earnestly looking to scrap with P.J. Tucker, and James Harden conducting the Rockets’ woozy show as usual. All of that is weird, but some of it is almost normal. Things got most confusing when Westbrook, hot off some wild makes, opted to go for two—despite the Thunder being down three, with no timeouts to advance the ball, and less than ten seconds on the clock. On that play the Rockets were clearly just trying to lock down the perimeter, and P.J. Tucker more or less watched Westbrook drive by him and dunk, not wanting to risk a foul. The Thunder’s win probability barely budged after Westbrook chose to spend that possession that way. They were down by one with apparently no means of speeding the ball up the floor (beyond one Russell Westbrook). A whole lot still needed to fall into place. And then, somehow, it all fell right into damn place. 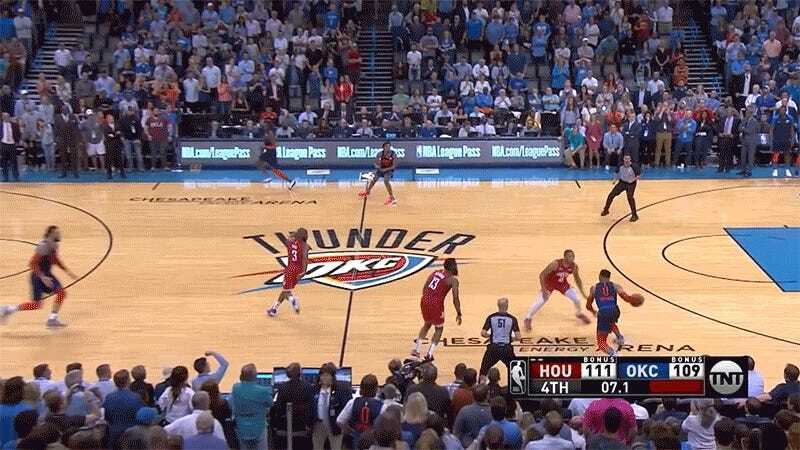 Westbrook immediately fouled Harden on the inbounds. An 88 percent shooter on the season, Harden made the first and bricked the second. Westbrook gathered the defensive rebound, barreled up to half-court, got mugged by a Harden-Eric Gordon double-team and barely passed out of it, ran and got the ball back from Steven Adams, and then swung it to Paul George in the corner. George then drained the go-ahead three with P.J. Tucker in his mug and 1.8 seconds on the clock. Harden shoved George in the neck to open up a relatively clean look at the end of regulation, but missed. The Thunder improbably survived, tacking another signature shot onto the highlight reel of what has been the greatest season of Paul George’s career, late-season shoulder-injury slump notwithstanding. He finished with 27 points, 9 rebounds, three assists and four steals; Westbrook racked up his 33rd triple-double with a cool 29-12-10. The Thunder have staggered to an 11-13 record post All-Star break and now sit at No. 6 in the West, but could still float down as far as No. 8 depending on the outcomes of the season’s final games. The Rockets, who are done playing, might still wobble between the second and fourth spots. But should the current standings hold, these two teams would square up in the first round this weekend—this weekend!—which would be delicious.